I know that this is a summer-y kale salad. And we have been having some of the most wonderful summer (more fall-like) weather lately. And ALL I can think about right now is fall. Particularly, football in the fall. And all of that is thanks to the beauty that is Friday Night Lights. I am not so sure what took me so long to discover this show after so many people totally raved about it. But I have finally jumped on the bandwagon in a full-force-binge-watch-Tim-Riggins-is-my-new-crush (move over Jimmy Fallon) kind of way. I mean, seriously, have you seen that guy smile? And I wish I was just a little bit kidding! I had a minor surgery last week (everything is fine!) but my recovery consisted of me sitting, the couch, my pillow and the boys of Dillon, Texas. And it made me so ready for football season. This salad is a nod to a salad at a restaurant I frequented in Kansas City called Unforked. 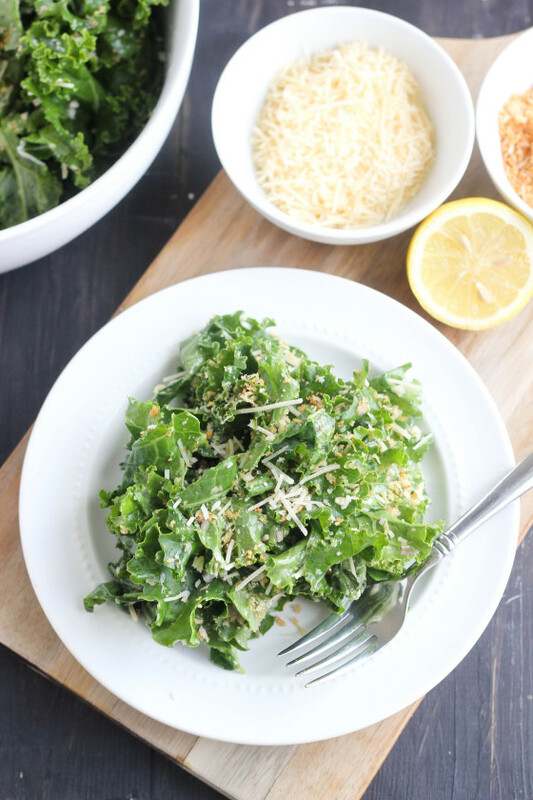 The salad is called “Hale the Kale” and has a perfect lemon dressing, parmesan cheese and crunchy, toasty breadcrumbs. Super simple but oh so flavorful. And I found myself with an abundance of kale recently so I decided to recreate it. I used a simple dressing with shallots, freshly squeezed lemon and loads of garlic. The salad keeps really well. I will make it over the weekend and then eat it for lunch all week. It’s a perfect side dish or main dish, especially if you add a little grilled chicken or steak! 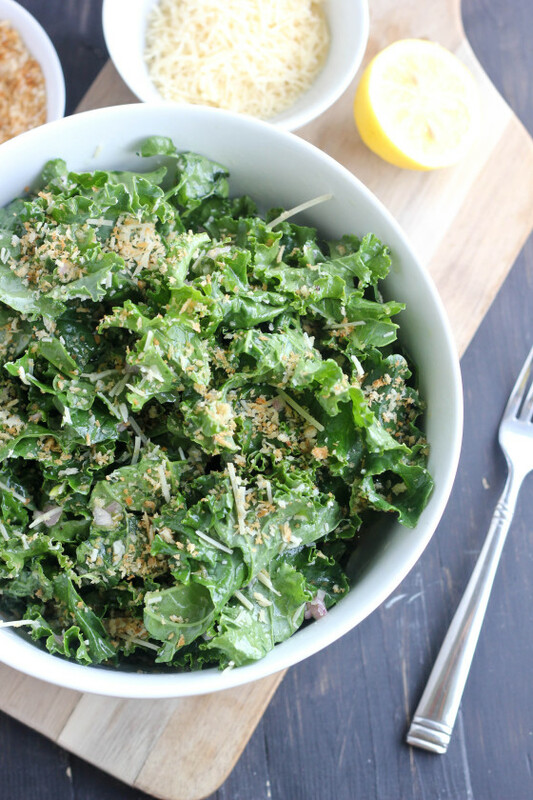 A fresh, summery kale salad with parmesan cheese, toasted breadcrumbs and a simple lemon vinaigrette. Melt the butter in a small sauce pan. Add the panko and heat for about 5 minutes, stirring often, until the panko is golden brown. In a small jar or bowl, mix the olive oil, lemon juice, shallot, and garlic together. I like to use a jar with a lid so that I can shake it together really well. Add salt and pepper to taste and then stir or shake once more. 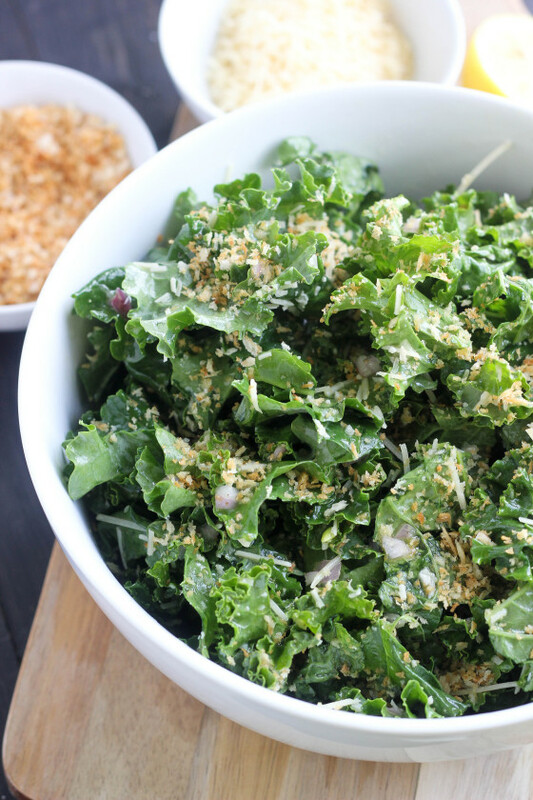 In a large bowl, toss the kale with the dressing. Add the Parmesan cheese and toasted breadcrumbs. This salad can be prepared ahead of time and refrigerated – wait until just before serving to add the breadcrumbs. Pretty, light and easy, love this salad. But it screams to me “add steak add steak” like you suggested so I think I will. I am SO not a football person, really, and yet I love love loved Friday Night Lights (and Tim Riggins, obvi ;)). This yummy salad, a marathon of FNL and my couch sounds like the perfect situation right now. Have so so much fun at your hike this weekend! It feels like fall here too, and I now have the football (ahem tailgating) itch too. Hope you’re recovered, Ashley! And your salad looks awesome – pinned! Hope you’re recovering well! I love simple summery salads like this! Just what we need as a side to go with all of our grilling! I LOVE this salad, Cassie! 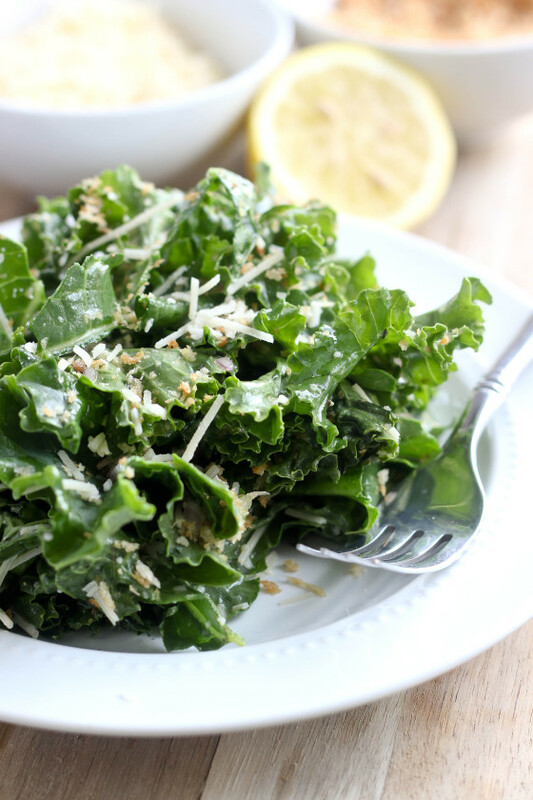 We’re huge kale fans, so this is a must! your right this is just the perfect summer salad.. love it. you can never go wrong with lemon and parmesan! I am equally as obsessed with Tim Riggins, I really would like to watch that whole series over again! This salad looks so light and fresh like the perfect thing to bring to work for lunch! I’m all about the kale salad love! I could see myself not getting tired of this rendition of it for weeks on end. Love that the dressing is both creamy and bright and lemony! That kale salad sounds interesting. I’ll give it a try. Thanks for sharing. i just made this wonderful kale salad. Thank you for this recipe. It is so delicious. Love how it keeps for days. This is my first year growing kale and I have tons. I added the peel of one lemon to my mix just because. In your write up you say loads of garlic. The recipe called for only one clove. Next time I will add more. We love loads of garlic. I love Unforked’s Hale the Kale, and when I stumbled upon this recipe that’s immediately what I thought of. I was so excited when I saw that is what you based it on! Tried it last night, and it was delish! Thanks!! Thanks for the comment! I love this salad and now I’m going to crave it. Glad you enjoyed!